Operationalisation of the much-awaited Noida’s Aqua Line, or the Noida-Greater Noida metro connector, will to a large extent address the challenge of connectivity being faced by sectors located along the expressway and some new affordable sectors. But while it may connect Noida to its sister city Greater Noida and lessen the travel time for homeowners who reside along the route, what it will not do is join the vital dots – connect Noida to either the city centre or for that matter provide the much needed link all the way up to Delhi or Gurugram. In short, it is caters to the needs of an island city. The line opens for the public on January 26. 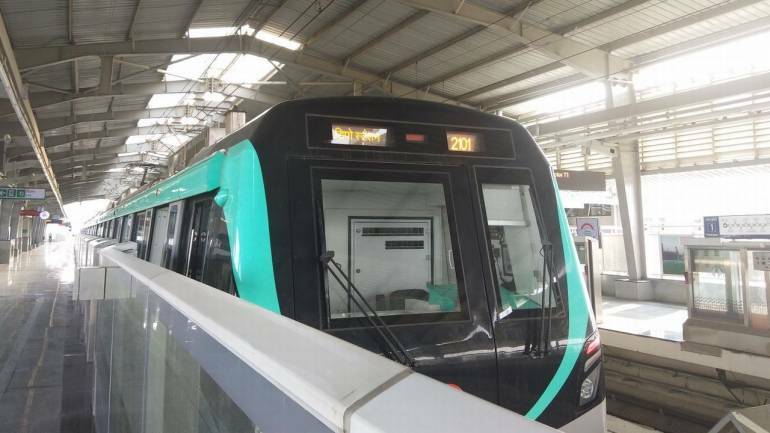 The biggest impediment in case of this Metro connector is that it does not provide a direct connector between the Blue Line of the Delhi Metro or for that matter the Magenta Line that goes right up to the domestic airport. In short, get ready to disembark at Sector 51 station and walk for about 8 minutes all the way to Sector 52 station to take the Blue Line extension that is still not operational. The two stations are almost 300 meters apart. For now, commuters would have to get off at Sector 51 station and hop on to another public mode of transport to take them to Sector 32 Metro station. Sources say it may take a while, perhaps months, before the two are connected through a sky walk. The Blue Line extension up to Sector 62, Noida is expected to be opened by March. The Magenta Line’s Okhla Bird Sanctuary station is over 10 km away from Aqua Line’s Sector 137 station. The most important question – will it lead to run up in property prices? Well, not really. Any appreciation in property prices takes place at the time of announcement of the project. But in this case, the construction phase of the metro project coincided with the slowdown cycle. It was also around this time when demonetisation was announced, followed by the enactment of the Real Estate (Regulation & Development) Act (RERA) and the Goods & Services Tax. However, what this new infrastructure upgrade will do is to improve absorption of residential units. Homebuyers sitting on the fence may consider ready-to-move-in units located along the Aqua Line, or those who had bought houses earlier may decide to finally shift. Overall, it may help improve absorption of residential units along the stretch, boost population density in the area and also rentals. Let’s take a look at the Aqua Line’s 21 stations: 15 in Noida and six in Greater Noida. These are: Sector 51, Sector 50, Sector 76, Sector 101, Sector 81, NSEZ, Sector 83, Sector 137, Sector 142, Sector 143, Sector 144, Sector 145, Sector 146, Sector 147, Sector 148, Knowledge Park 2, Pari Chowk, Alpha 1, Delta 1, GNIDA office and Depot Station. The current price of residential units in some of these sectors range from Rs 3,400 per sq ft to Rs 10,500 per sq ft. Recent reports by Knight Frank and JLL show improvement in absorption and even new launches in some of these markets. As per the JLL report, titled ‘India Resurgent Residential Sector’, launched earlier this week, Noida-Greater Noida continued to constitute majority (around 40 percent) of overall launches. Ghaziabad and Noida-Greater Noida contributed more than 95 percent of new launches in the up to Rs 50 lakh category, with the latter constituting 62 percent of sales. A Knight Frank report earlier this month said that new launched in NCR registered a 35 percent growth in the number of units launched in 2018, with about 75 percent of these units falling in Gurugram and Greater Noida. New launches in Noida and Greater Noida have also registered a slight revival in 2018, with developers launching new projects in Noida’s Sector 150 and Sectors 1, 10, Pari Chowk and Zeta 1 in Greater Noida. In case of sales too, Greater Noida yet again hogged most of the demand in 2018, with 50 percent of overall sales accruing from this affordable micro-market. Due to affordable pricing, the micro-market is not only attractive to buyers of Noida and Greater Noida but also adjacent tier II cities of Uttar Pradesh such as Mathura, Agra and Aligarh. The report noted that the unsold inventory stood around 142,007 units as of December 2018. Greater Noida and Gurugram account for about 65 percent of the unsold inventory in NCR, followed by Ghaziabad and Noida. The unsold inventory along the Noida-Greater Noida belt and located in Sectors 70 to 78, say experts, is likely to come down with the improvement in Metro connectivity within some sectors. “Price appreciation owing to any upcoming infrastructure is seen from the date of announcement. A direct correlation of the metro line with prices cannot be ascertained as the announcement of the corridor and the development phase in this case has coincided with one of the lull phases in real estate activity in NCR,” Ashutosh Kashyap, General Manager- Consulting (NCR) at Colliers International India, said. However, the impact of infrastructure upgrade finds its manifestation in terms of both price and absorption. “For micro markets closer to the heart of the city, such as residential sectors 74, 75, 76, 78 and 79, the emergence as one of the major residential hubs has been quick. 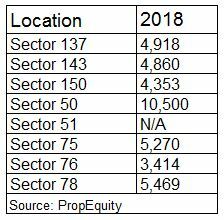 For emerging peripheral sectors, there is an evident upswing in buyer interest in upcoming residential projects, (specifically Sector 150 Noida),” he added. Noida’s commercial space absorption for 2018 was upwards of 3.5 million square feet in all, Anckur Srivasttava of GenReal Advisers said. While commercial real estate rentals in Gurugram commanded over Rs 75 per sq ft in the metro connected corridor, top-of-the-line A grade spaces in Noida with Metro connectivity may still be available in the sub-dollar range (Rs 40 per sq ft to Rs 60 per sq ft). So, despite improved connectivity, companies looking for affordable commercial spaces may prefer Noida over Gurugram. “The first stage in price improvement is to do with absorption picking up. Getting anchor occupiers is important for any new corridor to gain traction. Prices in Gurugram’s Golf Course Road improved after GE set up its corporate office there. The same trend was seen in Bengaluru’s Whitefield corridor. In Noida, prices may not rise immediately because there is no dearth of land. A shortage of ready A grade supply may help bump up rent for the short term, but not for the long term because of excess availability of land,” Srivasttava said. What may go in Noida’s favour compared to Gurugram is the sub-dollar rentals and affordable commercial supply along the Metro. “The sub-dollar rentals is a sweet spot for most KPO and BPO commercial space occupiers and that’s the reason why a few of them are now expanding to Noida. The latter is just about beginning to be seen as an alternative to Gurugram for ‘value for money’ conscious IT/ITES occupiers,” he said. Real estate experts also point out that with few developers now doing A grade commercial spaces in Noida, rentals may rise by about 5-7 percent in the short term as there is no paucity of land in the area. Developers such as Unitech, 3Cs (Lotus), which were earlier active in the commercial space, have now been taken over. The SEZ story continues to find favour with tenants. All of this is adding to Noida’s appeal as a potential institutional capital destination, Srivasttava added. The biggest challenge in case of commercial space absorption may also have to do with limited connectivity being provided by the Aqua Line. Had it connected these sectors to at least the Centre and further to Delhi or Gurugram, the impact may have been much more, experts added.